The one problem I have always has with bean bags and why I said "I would never buy another one" is because they always seem to get hole's in them and get those little white pellets all over the place. O.K. maybe my Brothers and I were a little rougher on them then most but bean bags sure make a good landing pads when your doing flips off the furniture. That is until they would ultimately break and our Mom would put an end to our Stunt Man careers. What we needed was a bean bag that was made out of foam and one that could transform into a bed with a lot more surface area to land on. that is also used in sofa cushions. The inner liner is made of cotton/poly while the cover is double stitched corduroy that can easily be machine washed. Bryon started in the bean bag bed business back in 1998 and is the only company that makes the patented bean bag beds. It does not take much searching to see this product is already being carried by most of the larger bean bag companies online as well as a number of retail stores. All his products come with a Lifetime Warranty that makes me really wish we had one during our stunt man training days. We would of considered it a challenge and did our best to see if these bean bags were really indestructible. By the very nature of how they are made, I would have to say that these bean bag beds could even withstand that sort of punishment. If there is one thing that Season 4 has brought us on the Shark Tank is the diversity in the businesses they are featuring. Everything from an idea with lots of passion to back it up to full fledged franchise opportunities and everything in between. The CordaRoy's Beanbag Beds have already been on the market for 15 years which puts it in a class almost by itself. 15 years in any business is a long time and plenty of time to master this market. Why would anyone even consider bringing in an investment partner after that many successful years in the market? I believe Bryon already answered that question the best way possible on his Face Book Page when he said "Being Featured on the Shark Tank is equivalent to about $1 million dollars worth of advertising". That sounds like a really good answer to me but I think he may be on the low side of how much publicity is about to come his way. There is really no way to put a dollar amount on having your product/idea associated with the Shark Tank Show. Unlike just about every other form of advertising, an appearance on the Shark Tank will continue to pay dividends for many more years in the future. You just cannot buy this type of publicity for Any Amount of Money. This is such an awesome idea. I would like to purchase one. Can you please let me know when they become available?! Great idea Bryon!!! 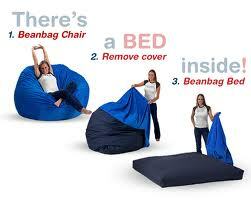 I think the bean bag bed is a great idea. I will definitely buy one. YA HAPPEN 2 HAVE LIL KIDDO SIZES? Lori us not very bright. Search for this product and you get nothing but dead links. She should have set it up for big sales tonight. Amazon is sold out of all the bean bag beds. Site is down and I cant seem to buy one anywhere. Lori Greiner should of seen this coming and better prepared for tonight. Not good for business when you keep a willing customer from buying your product. Agreed, same here. WHY CAN'T WE BUY THEM NOW??? HUGE mistake!!! Hey Bryon you did a great job on the shark tank tonight. Looking forward to purchasing a couple bean bags for our apartment. Good luck with your new business partner. Is Lori going to put these on QVC? I agree with previous posts. I went looking to buy one today and the websites are all down, which means my money probably will go to the next thing I see that looks pretty neat and has a functioning website. I want one but the site is down due to overload- help where can I buy one? Been looking for ideas, I'm very interested. Many wonderful ideas out there. Better get cracking on this! Or like another post said, the one that is available, will catch the fish. I will try to keep up to see where you are on production! It's wonderful to see someone dream come true. I would like to be part of that, buy owning one. Thank you, Shark Tank! Please keep us posted on your winners. All I can say about this Outdoor Sectional Sofa set it - wow! It is obviously made from top quality materials that are bound to withstand the harms of the outdoor setting. The furniture looks so attractive and it is very relaxing to sit on. It is definitely the perfect piece of furniture to have if you are fond of having your friends around. I personally like that it's made of wicker and that it is modernly designed to keep up with time! i was going to buy one of these tonight but the website is down. I REALLY want one of these.... and all the sites are crashed. Wow! Shark's Tank has a lot of viewers tonight! where can i buy one??? or two?? websites are not up and running? This is just what I need. I can't wait to see the price tag on this unique idea. I can't wait to buy one too and with Lori involved I know she will come up with more colors and patterns to choose from. I will buy one them as I just. Converted my garage into a family room with a sofa sectional and these will be great for the grandkids! Congratulations you will do so great with Lori helping you will do awesome. Please keep making it in America or I won't be able to buy one. Congratulations! You better get sewing! i had one of these it was the most amazing thing ever after a bit i ditched my bed and started sleeping on the bean bag made bed this is the bes seriously!! I want one but where can I get one? The website is down. I bought one of these back in 2008 for my college dorm. It's great! I would recommend it to anyone over its competitors. On shark rank Lori took advantage of all your hard work. Hope it pays off for you. Mall of America has them.